I love lilies! I mean why would you not – they are as easy to grow as they are gorgeous. 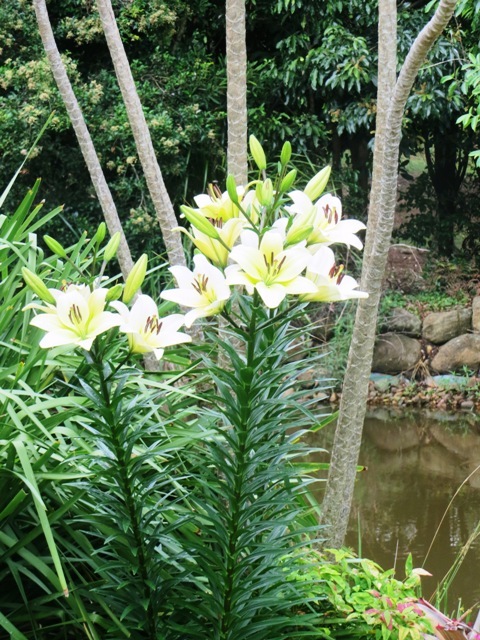 I especially love the tall, stately, so-called Oriental lilies which every late spring and early summer offer such a fine reward for so little effort. Have a look at this splendid specimen in my own garden, which right now is putting on a show that distracts the eye from the sorry state of our pond. We have had no significant rain for four months now so the pond is rather low – much to the delight of the herons that fish there daily for frogs. The poor old frogs are not nearly so enthusiastic though and must be desperate for rain not only so they can start breeding but also to put more water in the pond so they have somewhere to hide from the predatory birds. Anyway, back to the lily. In its first year after the bulb was planted it produced one fine flower. In the next year it was taller and produced a couple more. Last year it put on a better show and we had the pleasure of it for several weeks. This year it is, as you can see, a wonder to the eye. Not just by day but at night too, because it glows in the dark even when there is no moon, and can be easily seen from the sitting room window. 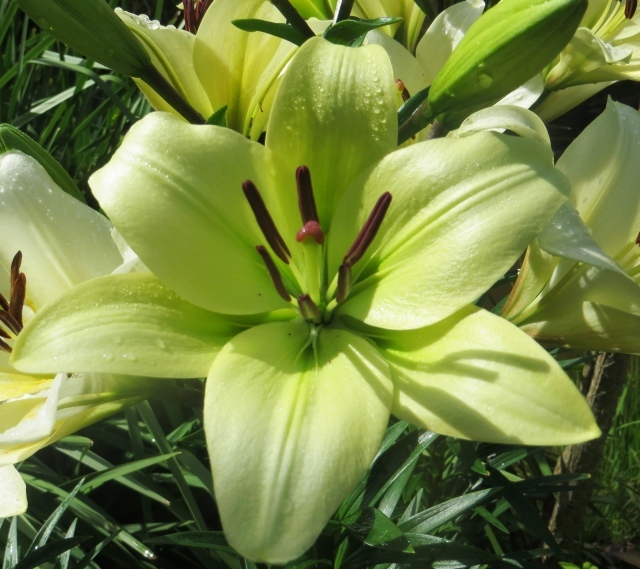 The “Oriental” lilies sold in garden centres or available from bulb suppliers today are highly-bred hybrids of several species of (mostly) Asian origin. They are similar to, but not quite the same, as those commonly called “Asiatic” lilies, just to make things confusing! The latter, however, are generally less tall and stately. They often have colour-contrast centres and are better in pots than the Orientals. 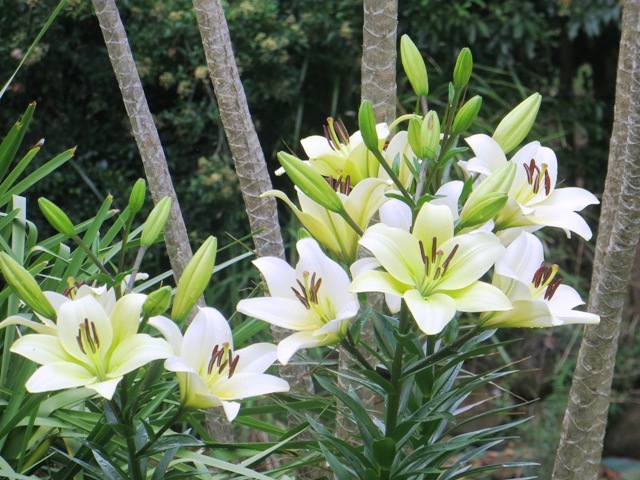 Both Asiatic and Oriental lilies are easy to grow but the latter are REALLY tough. Conventional horticultural wisdom says they do best in good, loamy soil, in part shade, with either well-distributed rainfall (especially in summer) or regular watering. Plus a couple of doses of fertilizer a year. Well, my beauty gets none of those things! It is growing in the most horrible, hard, stony soil you could imagine. It gets sun for most of the day and water only when I remember, which isn’t often. Sure, it gets deluged for a couple of months in high summer but we’ve just had four months with only a couple of inches of rain (about 45 mm) many weeks apart and only twice have I remembered to give my tall and splendid darling a drink! And I never feed it at all! Nor mulch it, though there is a fair bit of leaf litter around its base. Yet there it is, flourishing wonderfully. In this past year it has withstood both deluge and drought, strong wind and fierce sun. The older I get, and the more years I study and write about horticulture, the more I realise that plants are like children – they grow best and sturdiest if they are not too spoiled and protected and over-indulged. I don’t even know my lily’s exact name and nobody has yet been able to tell it to me. It looks a bit like the variety ‘Santander’ and a bit like ‘Rialto’ too, though it is too greenish in hue to be either. Perhaps it is an old variety and the name has been lost as new varieties come along. It looks like some sort of cross between L. auratum and L. speciosum, as most of these types of lilies are, probably with a couple of other species in the mix as well. Never mind, what’s in a name! All I do know is that I plan to get a few more of these lovely lilies when bulb-buying time comes around again.